Recently, the Spindleros have been expanding the brands we carry as well as our retail space to include a cafe with a kitchen full of pop ups and a sundry of pies and pastries from Tinkertown pies. Though we always allocate time to ride, gathering our scattered thoughts on paper has been a bit difficult. Luckily, we have amazing friends willing to put our recent brands through the ringer. Recently, Chris Scott Smith from the Toecutters, a bikepacking and touring crew, took some notes on his tried and tested Topo Designs Climb shorts. We had the privilege to shoot him and extreme model and filmmaker, Jay Ritchey for the review to coincide with his recount. Enjoy this in all its glory! I’ve always been on a constant search to find a pair of pants or shorts that feel comfortable while riding a bike. I have certain requirements and needs, unfortunately everything has fallen short. My requirements are simple enough. Something sturdy, made out of material that can withstand miles in the saddle and has deep enough pockets while showing off my gams. The last requirement being the most important. See, for me, I see all these shorts designed for cyclist, mountain bikers and tourers and my main issue is that they always end either just on the knee or perhaps a little longer than the knee. The problem is, with every pedal-stroke, I hate that constant feeling that you are wearing shorts as the hem kind of drags on your knee. To me, that just isn’t comfortable and it’s another area for possible hot spots. Plus I’m pretty sure fashion trends in men’s shorts are going the way of shorter shorts. 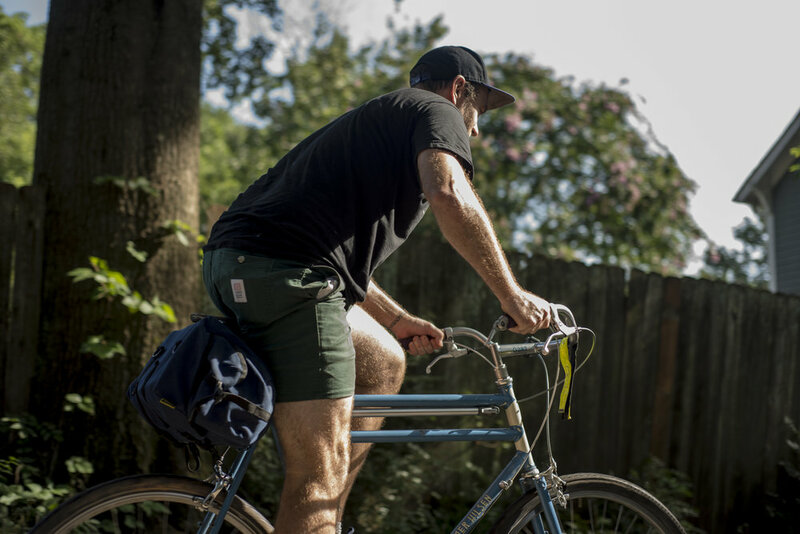 Now, there are commuter shorts out there or even touring shorts but in my search I just haven’t come across anything that doesn’t wear out over a short amount of time, stitching coming apart or fades after a couple miles in the saddle. Enter the Topo Design Climb Shorts. The climb shorts were designed for scrambling around rock cliffs because of the high range of motion they provide. If you are like me, you aren’t dumb enough to climb to stupid heights clinging for your life on the side of a mountain and prefer to stick to a leisurely jaunt on two wheels… on the ground…..where it’s safe. I found these shorts after seeing them on a friend. He let me borrow his (as most teenagers do) and I found them liberating. The shorts are made from a cotton and Lycra blend. The Lycra is only 2% but it gives these shorts a nice stretch in the legs while pedaling. They feature a button pocket and a zipper pocket which will ensure your wallet doesn’t fall out while heading the bar. In the saddle, they don’t give me that bunching which causes uncomfortable fabric rub in the seat of my buns. Also, they fulfill my most important requirement of being short so everyone can admire my powerful stallion legs. 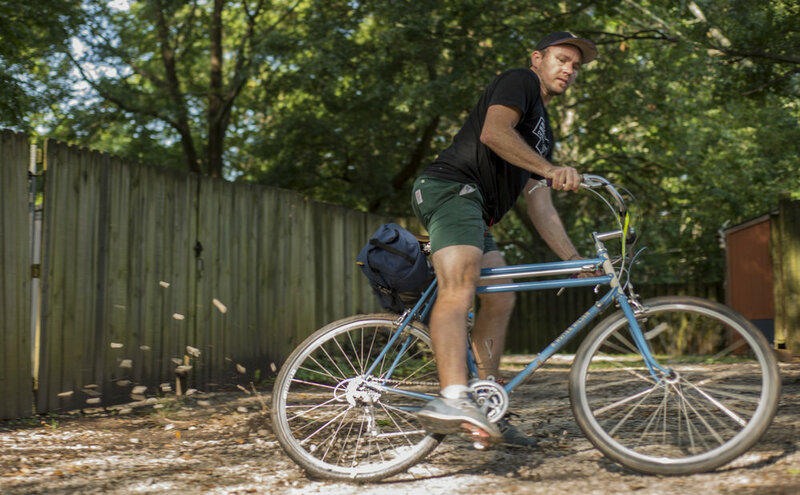 There are several other features on these shorts that are beneficial to cyclist making these more versatile than the climbing they were made for. Since the shorts have a more traditional form fitting fit but the gusseted crotch not only allows for more range of motion for those pedaling legs but helps against wear and tear over time from long rides. The side hand pockets are deep to keep your cellphone safely in your pocket. One thing Topo is also known for is the built-in cinch belts on their pants and shorts. 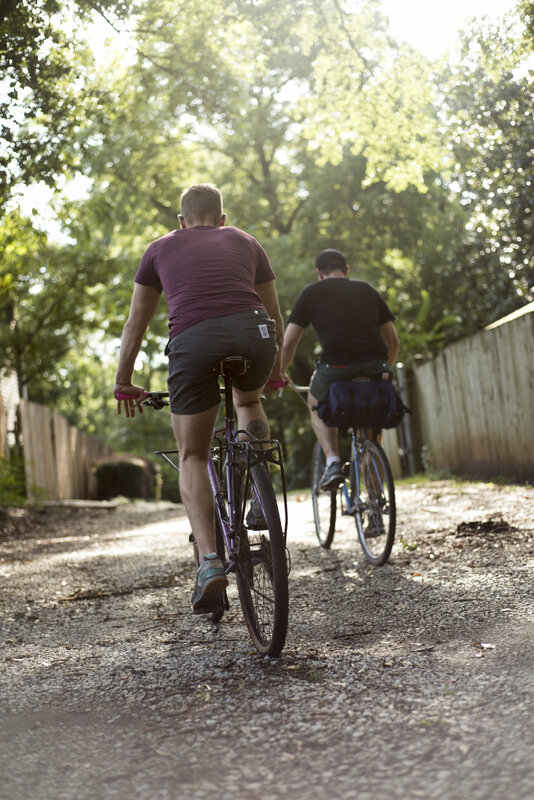 Riding around town or on tours, most of your favorite pair of shorts require the use of a belt. Anything with a large belt buckle can tend be too bulky riding around. The cinch belt simplifies the experience allowing for pulling up, hooking the T-lock fastener and heading out the door. It also allows you to hike up your trousers and and cinch em tight without having to stop. They come in several, non-offensive colors but the red belt gives them a pop. Even though they come in darker colors, after several hundred miles and almost a year later I haven’t noticed much discoloration or fading in the seat of the pants. These pants are awfully tough, as well. I have yet to experience any tears or threading coming undone. Sizing: There are only 4 sizes (small, Medium, large, Xlarge) This is due to the fact of the cinch belt allowing for them to fit a wide range of waists. For me I had a little bit of difficulty finding the right size. I bought several of their pants and shorts and between them I found different sizes fit better. Typically, I’m a 32”-33” and thinking most of my pants fall in the medium range found the medium to be really constricting. I switched to a large and have had no problem. Since I am in the lower size of the large range, they tend to stretch a little much after use so I’m having to cinch the belt a bit more often. Fabric: This one isn’t that big of a deal because these are DURABLE. But, the material can make it get a little hot and sweaty down unda’. After a long day these will be wet and the cash in your pocket will most likely not be accepted by any gas station attendant. They also, don’t dry incredibly fast so taking a dip and jumping back on the bike is not going to be comfortable. Topo does make another short that is perfect for this but sacrifices long term durability. Other than these two I honestly can’t say enough. I buy most of my pants from them now. Their climb pants are amazing for cold rides and have the same movement as the shorts. Both the shorts and their pants are stylish and have a slim fit making them look great on and off the bike.